Mehfil-e-Qirat was held on the 25th night of Ramadan in connection with odd night at Itikaf City on August 3. 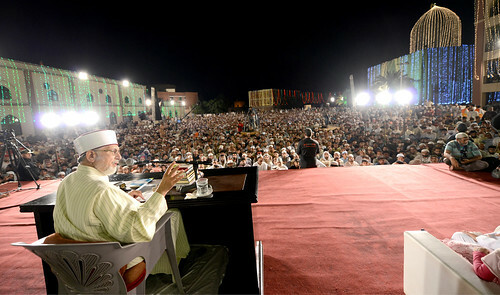 Shaykh-ul-Islam Dr Muhammad Tahir-ul-Qadri presided over the programme. Consulate General of Iranian Embassy and a group of Irani Qura were the chief guests at this occasion. It must be kept in mind that it is an annual practice of Irani Quras to attend Itikaf City of MQI every year. The proceedings of the programme got underway with the recitation of the Holy Quran followed by Naat. The Irani Quras electrified the atmosphere by reciting Beautiful Names of Allah Almighty, Arabic ‘kalam’ and the Quranic recitation in their characteristic style and melodious voices. Qari Hafiz Muhammad Karimi and Muhammad Isfahan of Iran replied 100 per cent correctly the answers of the participants in ‘Qirat Challenge’. Qari Ibrar Madni and Qari Hafiz Ahmad Hashmi also recited the verses from the holy Quran in their beautiful voices. Addressing the participants, Shaykh-ul-Islam Dr Muhammad Tahir-ul-Qadri reported a quote of Hazrat Ali Murtaza (RA) wherein the great Caliph said that whosoever joins company of the Holy Quran, listens and reads the Holy Quran with love, will end up getting two things; one, enlightenment would have increased and misguidance would have decreased. He said that the Holy Quran does not let anyone go empty-handed from its company. Shaykh-ul-Islam referred to a saying of Sayyidna Zain-ul-Abaideen (RA) wherein the latter said that the state of the one who establishes friendship with the Holy Quran is such that if all creations die in the vast expanses of earth from East to West and the whole earth becomes empty and barren, he would not feel any fear, loneliness or wilderness because the Holy Quran would be with him. When Imam Muhammad Al-Baqr and Imam Zain-ul-Abaideen (RA) would recite the Holy Quran, a crowd of people would gather in front of ‘Bab-e-Aehle Bait’ in Madina. The people would stop and see as to who was reading the Holy Quran in such a painful voice. Who else was a truer possessor of pain of separation and grief than Hazrat Zain-ul-Abaideen? Dr Tahir-ul-Qadri said that the holy Quran is such a friend, the company of the Quran is such a company, for whosoever befriends or joins it with sincerity of heart, the Quran does not let him be alone not only in this world but also in the grave. On the Day of Reckoning, the Holy Quran would go with the man. The Quran would say: O Allah, this man continued to read and listen to me with love in the world. I am going with him to leave him in paradise. Shaykh-ul-Islam further said that revolution has been the need of the poor and needy. He said that the reading of the Holy Quran makes it clear that no Pharaoh or ‘Qaroon’ or ‘Hamoon’ ever paid any heed to the Prophets’ message. Yazid refused to accept the allegiance of Hazrat Imam Hussain (RA). He said that going by example of any country, it becomes sufficiently clear that the revolution came only after the poor and less privileged sections of society got up for their rights. The land lords, industrialists, and the moneyed classes do not need revolution. They are comfortable in the continuation of the status quo, he added. Quoting a Hadith, Dr Tahir-ul-Qadri said that Allah would say to a weak person as to why he did not raise a voice against the oppressor. That man would say: O my Lord, I was aware of oppression and suppression committed on me but I was fearful of the oppressors’ fear and power. Allah Almighty would order such a person to be thrown in hell, for he got afraid of fear of the oppressors but did not fear Him. Dr Tahir-ul-Qadri said that when ten million new members would be ready to join the revolution, it would sweep away the forces of falsehood. On other hand, he who did not rise against the oppression should wait for Allah’s torment to descend. He would envelop such a nation in His torment before its death. Only those societies would be safe from torment that would uphold the banner of truth and justice against the evil forces. The speech of Shaykh-ul-Islam ended at 2:30 p.m.